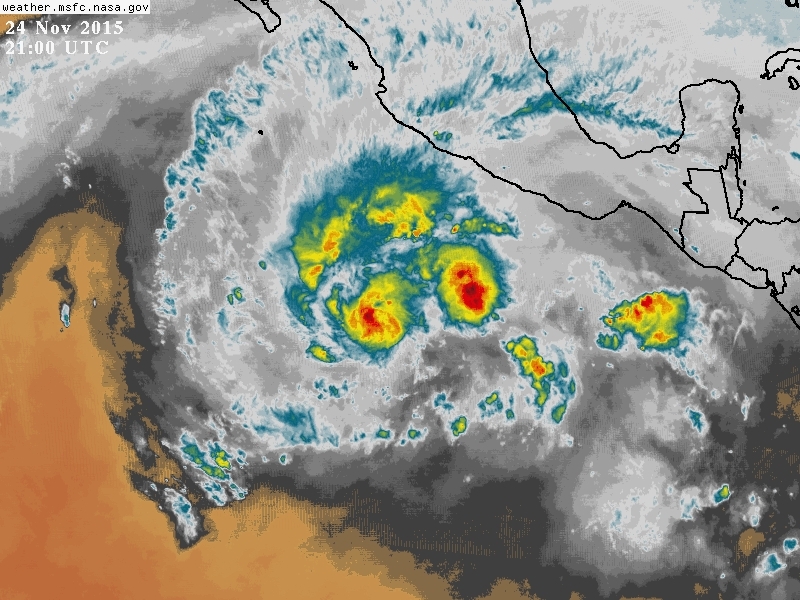 ...comes the twenty-second tropical system, the eighteenth named storm, and soon to become the thirteenth hurricane of the 2015 eastern Pacific hurricane season. Its name is Sandra. 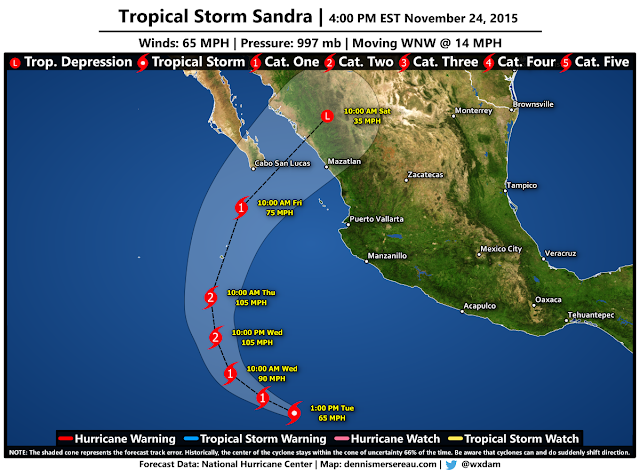 Given the favorable environment, Tropical Storm Sandra is expected to continue strengthening through the day on Wednesday and become a category two hurricane before weakening as it gets caught in a strong steering current that will turn it toward Mexico (and allow it to weaken). It's entirely likely that Sandra will briefly grow into a category three before all is said and done; intensity forecasts are harder for the experts to nail down than track forecasts, and storms that rapidly intensify can blow past what we mere mortals think the all-powerful atmosphere will do. Sandra's worst winds and rain will probably miss Cabo San Lucas, but the resort town is firmly within the cone of uncertainty and it's possible that the storm could travel farther northwest than forecast. Cabo is still recovering from the mess Hurricane Odile left in its wake last year, which was documented in horrifying detail by veteran storm chaser (and all-around awesome person) Josh Morgerman. 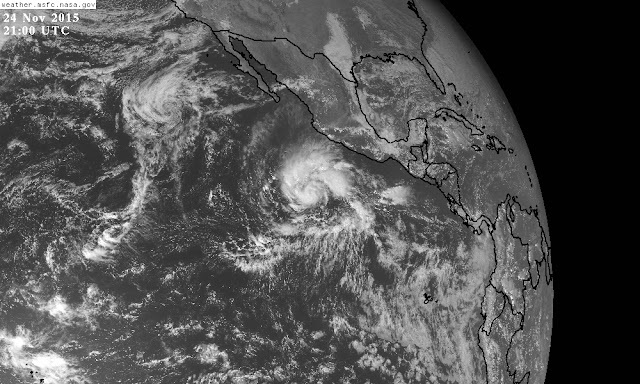 The system, which should be a tropical storm or tropical depression by landfall, will come ashore several hundred miles north of where Hurricane Patricia made landfall last month. Patricia was the strongest tropical system ever recorded on Earth in terms of winds, with maximum sustained winds of 200 MPH measured by multiple Hurricane Hunter aircraft on October 23, 2015. As strange as it seems, this humble tropical system in the Pacific Ocean will help to allow ample amounts of snow and ice to fall on the central Plains (again!). 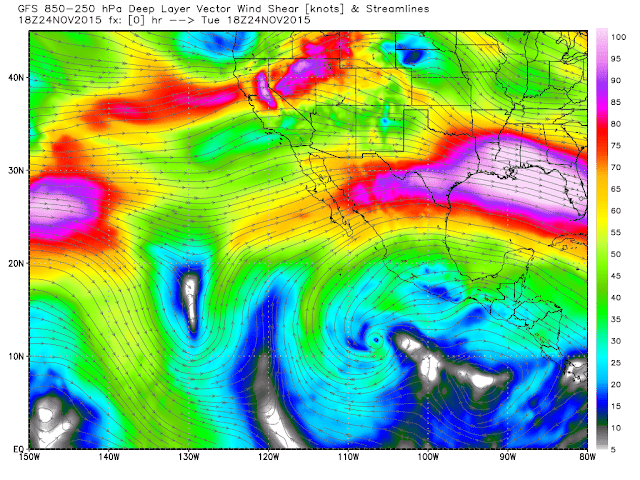 The same upper-level flow that will steer Sandra into Mexico is scooping up vast amounts of deep tropical moisture—both from the Gulf of Mexico and the eastern Pacific where Sandra is swirling—venting it over the central United States. This moisture will collide with an approaching cold front and allow heavy rain, snow, sleet, and freezing rain to accumulate from Texas to Iowa. 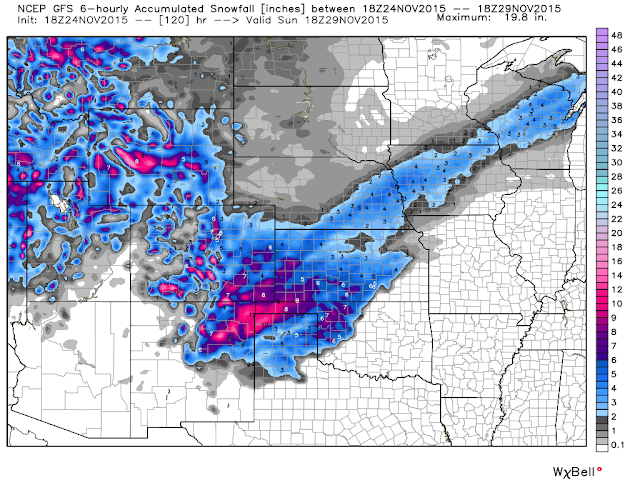 The latest run of the GFS model shows a decent winter storm stretching from New Mexico through the Upper Midwest between Wednesday and Friday. Snow is snow, but what's most concerning is that this could be a widespread icing event from Texas to Nebraska. The same run of that model shows significant accretions of freezing rain along a corridor from the Texas Panhandle through central Iowa. These ice accretions could exceed one-quarter of an inch, which is enough to down power lines and cause extensive tree damage. Any further accretions of ice will exacerbate problems and make travel (by road, rail, and air) nearly impossible in the affected areas. The specifics—when, where, and how much—will be nailed down by forecasters in the next day or two, so if you live in the area, keep an eye on their forecasts to see what kind of disruptions you're expecting. A small change in temperatures can have a big impact on what you see. You know that insurance commercial that jokes about people traveling for the holidays, saying " over the river and through the woods, sliding down an icy driveway and through grandmother's garage door?" Try not to do that, please. Hmm. How much does the hurricane's trajectory determine the eventual path of the winter storm? As it stands, that storm track is going to miss me by about as much as Skittlebip IV did. If you have the time, Mssr. Mersereau, could you get in touch with those nice fellows up at HAARP and convince 'em to angle the storm down by, say, 10 degrees? That'd be about perfect. Great information. You have a good Thanksgiving. Thanks for the update, Dennis. Hope you have a great Thanksgiving weekend. I am thankful that there won't be any snow/ice this year in the PA I-81 corridor so I can drive to see my parents on the 26th. Hey, Dennis! Just found out that you are no longer with Gawker. Their loss, our gain! Glad to be following you here. That the color is practically off the scale of that water temperature chart at 180° does not seem very pleasant at all.